Writing at the turn of the twentieth century, the novelist E.M. Forster, saw a society in a state of continual flux, as the Edwardian Age struggled with one foot in the past and one in the new. Over a 100 years on from then, and as we face into the Fourth Industrial Revolution, ‘only connect’ is a sentiment that resonates today. It was in this spirit that I, in partnership with Neo, co-created a workshop as part of the wonderful Meaning Fringe Festival. Our purpose was to take an hour and half of a diverse and thoughtful group of people’s time and create a fun and stimulating workshop that explored the power of purpose and how you create a brand from the inside out. Research tells us that meaning making is hard-wired into our DNA. As Viktor Frankl, neurologist, psychiatrist and holocaust survivor wrote so movingly about in his seminal work, humans have a desire and drive to create meaning and purpose in their lives. Recent studies show how having purpose and experiencing intrinsic motivation in the work that we do improves our mental and physical wellbeing. For large numbers of us, work plays a significant role in our lives, yet how often do we find real meaning in the jobs that we do? How often do we feel aligned to the purpose of the organisations that we work for? Or, how often does the organisation’s purpose resonate but our actual experience of it doesn’t – either as employees or customers? These were some of the ideas we explored in our workshop. In defining culture and brand, our participants surfaced many and varied thoughts, but all identified brand and culture as two sides of the same coin; as expressed so wonderfully by one of our participants “Brand is the essence of who you are, what you do and why”. So, how do you decide on all of those big, existential questions? How does an organisation define its true purpose? How does it ensure that its purpose lives and breathes through all that it does (not just through what it says)? How do you knit together brand and culture to create a golden thread that unites your organisation’s ‘why’ with your people, be they your customers or your employees? The answer, as echoed by those in our workshop, lies with those very same people. Culture is generally accepted to be the set of shared assumptions, values and beliefs that live in the behaviours that people model, in the artefacts and in the rituals and the stories that are told. To explore this further, our generous hearted participants shared their own stories of personal or professional triumphs and, in so doing, surfaced some of their own values and beliefs. Resilience, compassion, courage, integrity were just some of the values or traits that spoke to the listeners (when they truly listened) when hearing their partner’s stories. Determination to complete that marathon, building a high-performing team, or volunteering to mentor and coach ‘Leaders with Babies’ spoke to the values that drove people’s behaviours. And yet how often do we find ourselves presenting a certain persona of who we are when we walk through the office door? How many of the values and beliefs that define us are left at home because we believe we can’t bring our whole selves to work? Or, conversely, if we do, how do we choose to show up? Depending on our position, which parts of ourselves do we consistently dial up? As a senior leader in an organisation, where power is in our favour, which values and behaviours do we choose to model? To cite Viktor Frankl again, how do we choose to respond? Management guru, Peter Drucker, famously said that culture eats strategy for breakfast, noting that organisations neglect their culture at their peril. The pace of change (now the ‘new normal’) is driving organisations to constantly refresh or refine their strategies, their brands, their business models. In so doing, they must be mindful of not neglecting their culture, careful not to assume that the brand values they espouse are part and parcel of their organisation’s culture. As voiced by our workshop participants, culture is not a set of values enshrined in posters on your office wall or in the strap line underneath a brand logo. To quote another management guru, Charles Handy, culture is ‘ the way we do things around here’. Organisations shouldn’t underestimate that ‘the way we do things around here’ can easily stymie, block or side-track the best strategies, brand launches and robust business models. So how do you connect an organisation’s people with its why, its how and its what? How do you connect an organisation’s people with their work, their journey, their values? How do you build a brand that is the essence of those things? The answer lies with your people. Through co-creation, through giving people voice, through enabling true collaboration (especially across silos where sub-cultures often exist), through communication and, importantly, through listening with an open heart and mind. 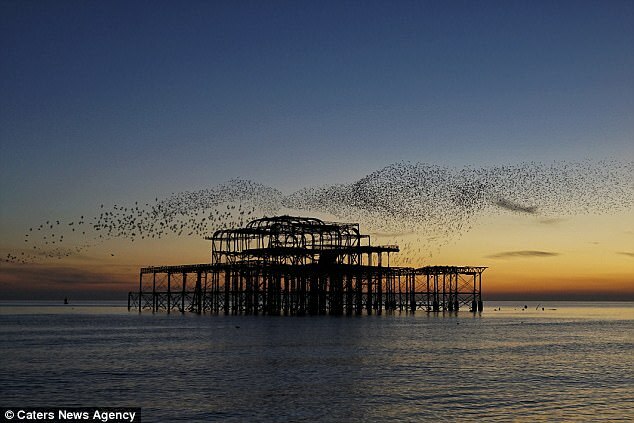 As expressed through the metaphor of the murmurations image above, the starlings are working in harmony in order to flourish collectively and individually. How they come together, how they behave, creates their identity – and as a result it’s a magical, awe-inspiring thing to watch. Next StoryWe love your difference – just please fit in!